A great glass of wine transports the person drinking it back in time by giving them a taste of the past. Each bottle is a time capsule of the winery during that year, but in the case of the Aeternum Winery, each bottle is also a time machine if the wine is consumed in the cellar. 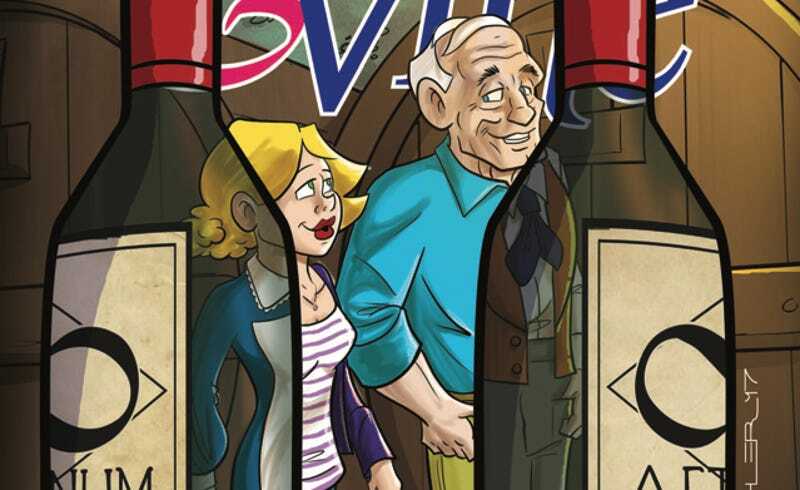 Thomas F. Zahler’s Time & Vine (IDW) is a four-issue miniseries that uses this fantastic concept to explore the lives of two strangers struggling to overcome personal obstacles. Jack is the widower who owns Aeternum Winery, and when he meets a young woman worried about her mother’s worsening Alzheimer’s disease, he decides to relieve her troubles by taking her on a magical journey to the past. Time & Vine tells a sweet, heartfelt story, offering a sentimental view of the past as it looks at how people and relationships change over time. Zahler doesn’t get too hung up on the logistics of the time-traveling wine; he sets some basic rules for how the magic is activated, but otherwise he expects readers to accept that this wine has supernatural properties and not ask too many questions. What really matters is the relationships between characters, which Zahler builds with compassion and empathy. These dynamics aren’t especially complex, but there’s a warmth to them that makes them engaging, from the budding friendship between Jack and Megan to their individual bonds with the people they love and are afraid to lose. Zahler’s cartoonish artwork and Luigi Anderson’s soft coloring give Time & Vine a gentle visual sensibility that fits the script well, and while there could be more refinement in the character expressions and body language, the storytelling is still clear enough to hit the emotional beats of the story. There are some definite consent issues when Jack brings Megan to the cellar and takes her back in time without her knowledge, but these are immediately addressed in a way that makes sense within the narrative and quickly casts Jack as kind rather than creepy. A small moment that stands out is when Megan is talking to a fellow Aeternum employee who has also traveled back in time, but as a black man, Darren’s experience in the past wasn’t very kind to him. He introduces the idea that these trips to the past aren’t necessarily the amazing gift they first appear to be, and while Megan is having a lot of fun at first, her traveling becomes more fraught when she discovers shocking information about her family. Romance is a driving force of Zahler’s comics: His Love And Capes put a rom-com spin on the superhero genre, and his 2015 miniseries, Long Distance, told a more grounded love story as it explored the courtship of a couple trying to make a new relationship work across state lines. While the dynamic between Jack and Megan is platonic (leaning toward father-daughter), there’s still a romantic bent to the narrative as Megan discovers more about Jack and his late wife’s history by seeing it with her own eyes. 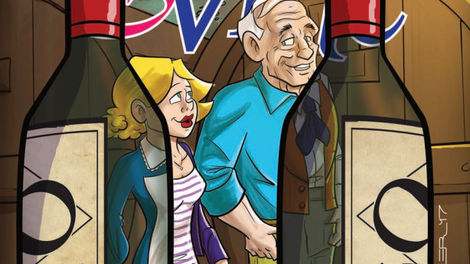 A book like Time & Vine is a hard sell in the current comic book marketplace, but IDW makes it more attractive by having double-sized issues at only a dollar more than the publisher’s standard single-issue price of $3.99. This isn’t the most challenging read, but it will scratch an itch for readers who want personal stories with a fantastic twist.